Honorees include Colin Kinney, Gabrielle Elkin, Victoria Terranova and Katelyn Douglass. OAKLAND — Messalonskee High School principal Paula Callan recently announced its December Student of the Month recipients in a news release. Called to the Performing Arts Center stage on Dec. 20 were senior Colin Kinney, junior Gabrielle Elkin, sophomore Victoria Terranova and freshman Katelyn Douglass. Kinney has a willingness to help others, Elkin was recognized for academic and dancing excellence, Terranova has a strong work ethic and perseverance, and Douglass, along with her academic achievements, was described as a student who always has a smile on her face. 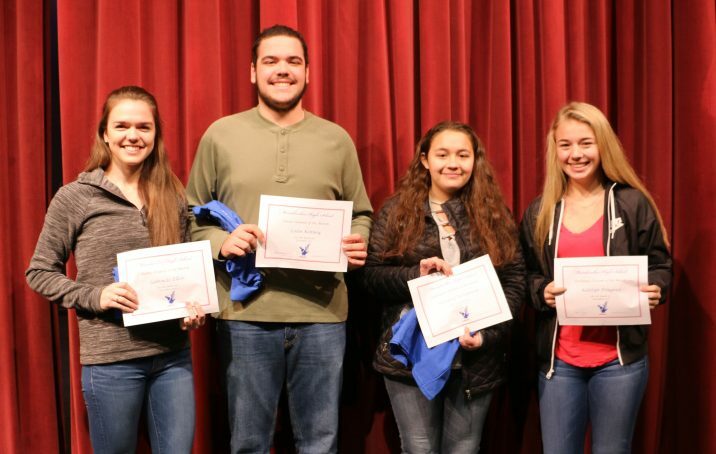 Callan also recognized the following four Messalonskee students who earned Student of the Month honors at Mid-Maine Technical Center: Megan Smith, medical careers; Jasmine Lambert, mass media communications; James Pino, criminal justice; and Parker Brunelle, construction technology.